Demand for PHYSICAL silver bullion is robust in Asia. Buyers in the Eastern Hemisphere are not buying PAPER silver derivatives. They are buying actual 1000 oz silver bars by the metric tonne. People in the Middle and Far East prefer real bars, rather than paper contracts — for liquidity and no third-party risk. Silver is now accepted as reserve-asset/ monetary reserve in Asia. China has announced plans to diversify reserves into silver. Silver is now globally recognized as a currency hedge. India is beginning a silver-monetization plan. Use of silver in HIGH-TECH-EVERYTHING is increasing; silver is irreplaceable. The inelastic supply of physical silver is low worldwide. China is now the second largest silver producer; Russia is #6; the U. S. is #8. Neither China nor Russia export the gold or silver they produce. of silver from the West to the East. Phenomenal growth in silver demand in China and India: Twenty years ago, China was a small player in silver. Now, the country accounts for about 20% of global demand. Many buy silver because it is more affordable than gold. Indian investors have turned to silver since the government began to heavily tax gold investments and put severe restrictions on gold purchasing. In general, Asian investors are buying silver to protect their wealth from currency devaluation. A surge in net investment has resulted in a huge decline in net silver supply from above-ground silver inventories. Global central banks do not have silver. 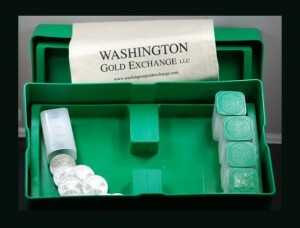 Government mints around the globe have announced they have no silver supply. WORTH MORE THAN TWO IN THE BUSH. It is becoming commonplace for silver to be in “backwardation” on commodities exchanges. That means the biggest buyers in the world are willing to pay a premium over and above the spot price so they can take delivery of silver while they can still get their hands on it. Customers want the precious metal right now, so they pay a premium to get their silver sooner, rather than later. Mine output of silver is shrinking. Silver is a major by-product of copper, zinc, lead, and tin mining. Due to the decline in the world economy [collapse in manufacturing], mine output of industrial metals is being reduced. And America’s hundred-year-old government stockpile of 6 billion ounces of silver is completely gone. The silver supply is traveling from the West to the East. In order to mint American Silver Eagle coins, the U.S. Mint now buys silver on the open market. Put a significant portion of your retirement funds in real silver money. 1 Troy ounce of pure silver. 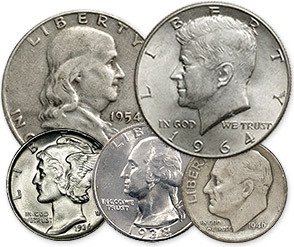 “Bags” of U.S. 90% coins (pre-1965 quarters, dimes & halves) are sold in various sizes. Questions? Quotes? Customized Model Portfolios? Bonds Are In the Bubble of Your Lifetime.